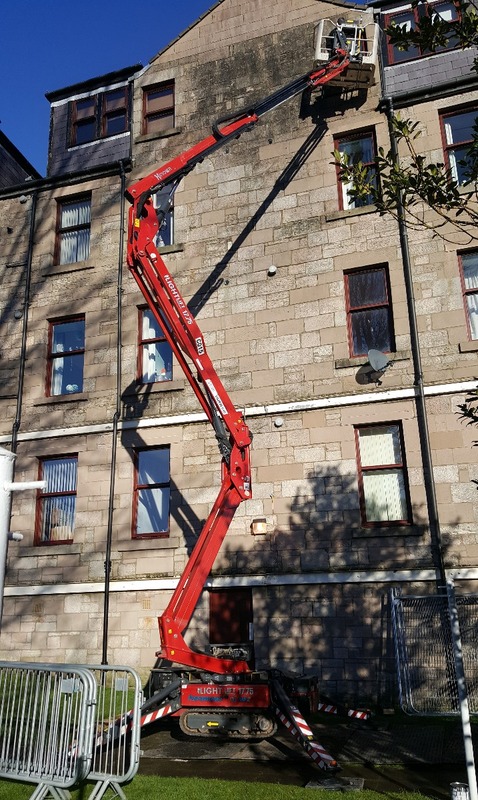 The compact and lightweight characteristics of a Hinowa boom lift solved a tough access challenge for a property maintenance company. 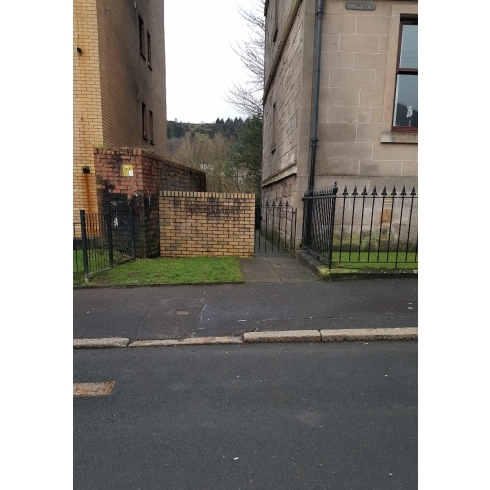 The client required an access platform to paint the window frames of an apartment block in Greenock. 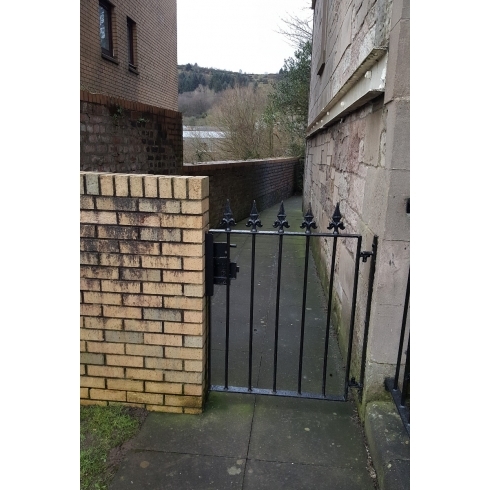 However, the machine had to access the rear courtyard via a narrow gateway and passage, which was less than 1 metre wide. 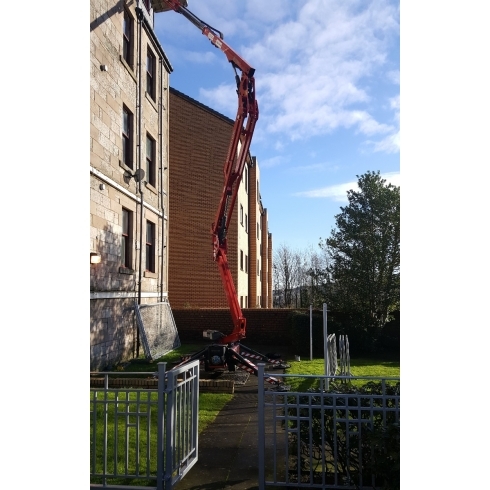 Active Access supplied the company with a Hinowa Lightlift 17.75. 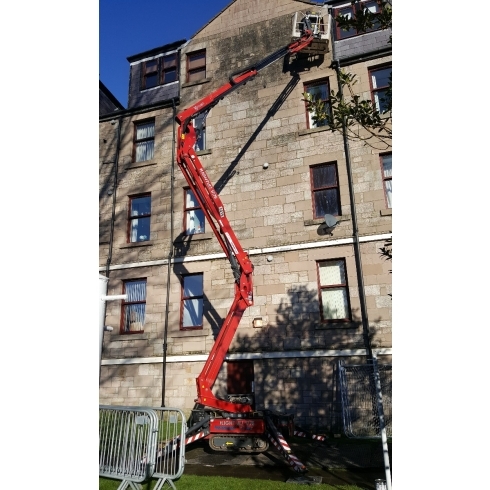 Mounted on a crawler chassis, the LightLift 17.75 has a stowed width of 0.79m, making it ideal for accessing hard-to-reach job sites; while its low ground pressure ensured it could be deployed safely in the courtyard. Paul Dynes, Sales Director for Active Access Ltd, said: “This painting and decorating company is a longstanding client of Active Access. They are often working in tight spots, and they trust our expertise when it comes to machine recommendations. The Hinowa Lightlift 17.75 Performance IIIs has a platform load capacity of 230kg, available without restriction throughout its working envelope. 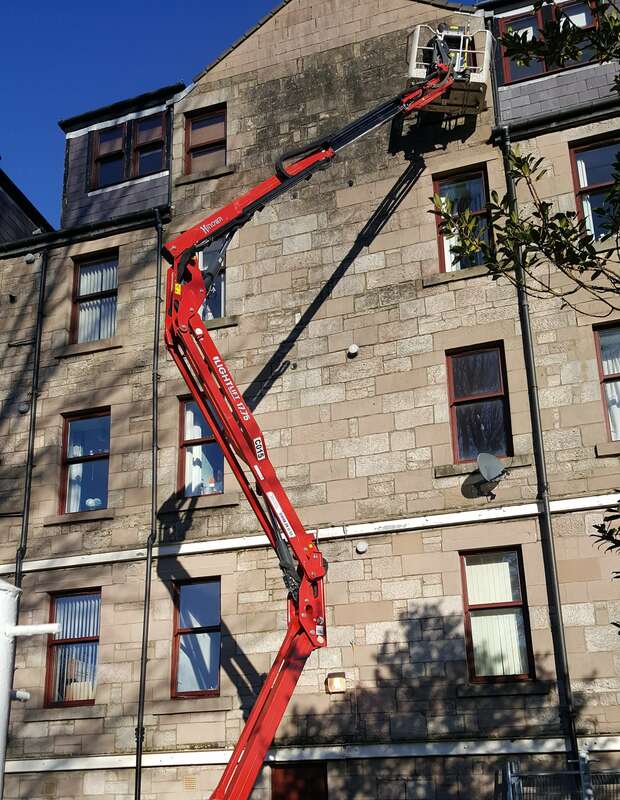 The tracked boom provides a working height of up to 17m, maximum outreach of 7.5m, and features a dual pantograph lifting mechanism which enables it to be used flush against a wall. Other features include fully automatic stabiliser deployment, for quick and safe set-up. The Hinowa 17.75 is available in a petrol or diesel engine combined with a mains electric power, or with a lithium battery option, for quiet, pollution-free operation. 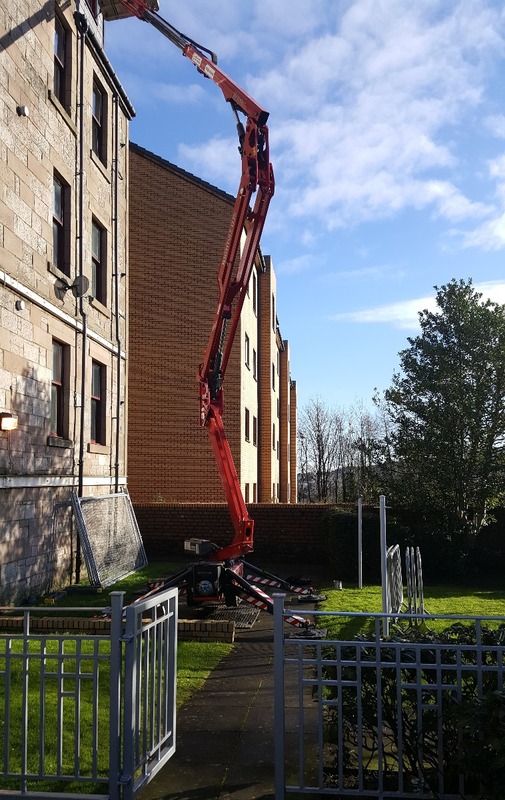 Access rental specialist Active Access has one of the largest hire fleets of tracked booms in Scotland, with Hinowa machines providing 14m, 17m, 20m and 26m working height and a 33m arriving soon. They purchase all their Hinowa platforms from Access Platform Sales (APS), the UK’s authorised distributor for Hinowa booms and tracked mini-dumpers. 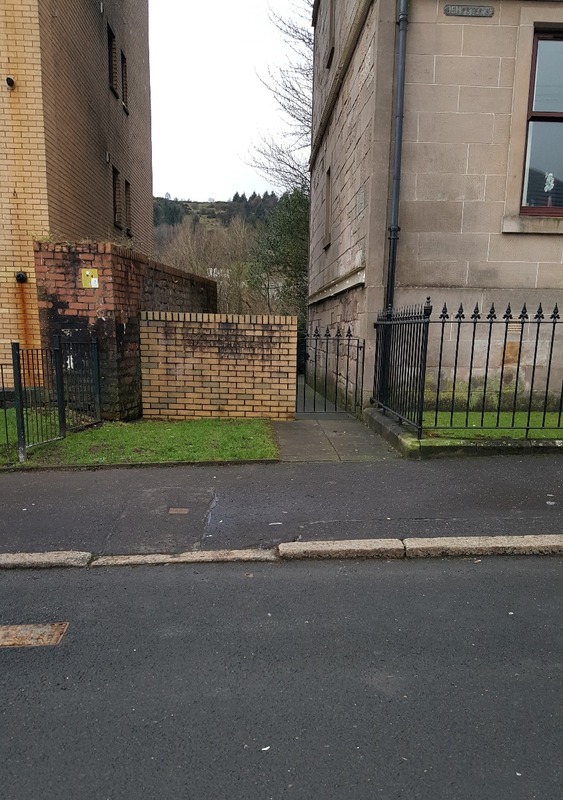 Based in Bellshill, Active Access offers a wide range of access platforms on long and short- term hire, across Scotland and into northern England. It also provides IPAF and PASMA training, as well as sales and maintenance of access platforms. 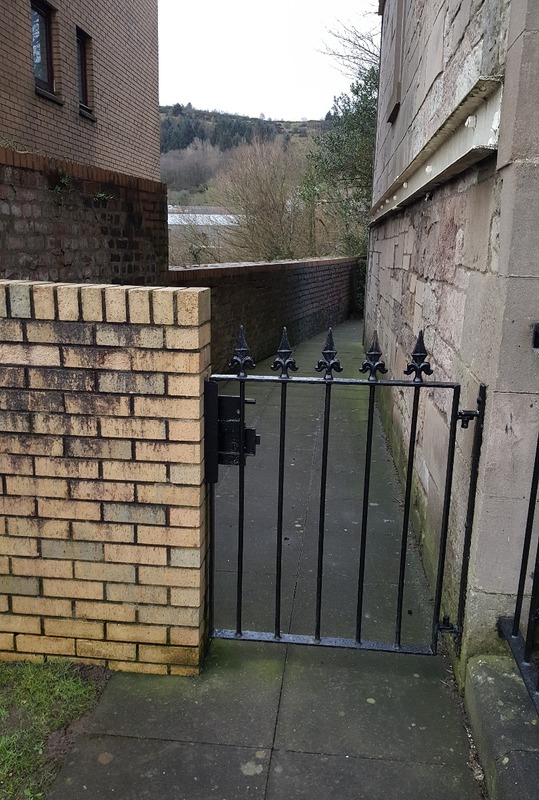 Active Access is a leading member of the Access Alliance, a collaboration between some of the UK and Ireland’s strongest independently-owned regional powered access sales and rental companies. For further information, please visit www.activeaccess.co.uk.